Truth is of the mind, Mercy of the heart. Truth is an aspiration, Mercy a condescension. Truth is 'above', Mercy is 'below'. Truth is narrow, Mercy is broad. Truth is fixed, Mercy is arbitrary. I have been reading the new revelations from the USA about another bishop and his successor covering up the ongoing abuse of adolescent boys, and elsewhere the present day promotion of clergy that are far from the chaste ideal and steal from their parishes to support a deviant lifestyle. Trying not to be judgemental, trying to see the case for the bishops concerned when they stand before God, I suspect they will plead, "I was being merciful", only to met by the voices of the abused who will cry out to condemn them, "Yes, you were, but not to us". Righteousness and peace have embraced. Mercy when it does not meet truth, really does seem to be a source of corruption, something to make even a child cry out, 'Its not fair', Without a conscience honed by truth mercy can so easily become an instrument of oppression. Cardinal Kasper sees mercy as the chief attribute of God. For him Jesus Christ is God's Mercy made flesh. Man's redemption comes from God's mercy, not his justice. Of course he is right but Man is not God. Meister Eckhart said, "if we say God is good then we cannot say that man is good, if we say that man is good then we cannot say that God is good", he might well have gone onto say the same about mercy, God's mercy comes from his perfection, in his imperfection man cannot imitate it. Mercy is a divine attribute, in God's hands it is always arbitrary but it is always good but when it is exercised by fallen human it always tends to corruption. Back to child abuse: I almost understand that parents might not want to prosecute an abuser of their child, but if they claim they are being merciful, but who are they being merciful to. They are not being merciful to the next victim when the offender goes on to abuse again and again. They are not being merciful even to the abuser if he (or she) then goes on to perform even more serious acts of abuse that might lead to their eternal damnation or even a life spent in prison. Whilst we might be hard wired to have an understanding of truth, mercy is a little more problematic. It is certainly merciful to feed the hungry, clothe the naked etc,, we can understand that. Scripture tells us that it is an act of mercy to correct the sinner and to teach the ignorant and counsel the doubtful but I do not think that sits well with our current non-judgemental understanding of mercy in the Church. Mercy tends to confuse. When we talk of truth we tend to have a consensus of what we mean, Mercy however as we saw in the Synod tends to be divisive. A year ago Bishop Egan said not giving Holy Communion to the pro-abortion politicians was act of mercy, the rest of the Bishop's Conference did not agree and when the Pope praises pro-abortion politicians we might presume he too would oppose the good bishop. We may either cause or share the guilt of another's sin by praise or flattery, or even silence or by corrupted or even deviant sense of Mercy. Yeah well said, I have not thought of mercy in these terms before. Who are you to set Truth against Mercy? Awful post. Thanks, Father. I know many who think anyone who criticizes the evil actions of others is an unmerciful pharisee. Come to think of it, I think the pope fits in that group. On the other hand, how merciful is it to see someone on the brink of hell and cheer them on as they totter there on the edge? The people who cheer them on, clergy or lay, don't believe there is a hell. Thank you Father for your lucidity in the midst of confusion and mayhem in the Church. I have read, interestingly, that mercy cannot or rather should not be called an attribute of God because there would have been no mercy before there was sin. So God's mercy a function of his Love for his creatures, is perhaps a contingent attribute, if such a thing is possible, rather than a name of God, in the Dionysian sense, from all eternity. Does that make sense to you? Have mercy on your flock and cast out wolves in sheep's clothing. You hit the nail right on the head "We may either cause or share the guilt of another's sin by praise or flattery, or even silence or by a corrupted or even deviant sense of Mercy". This is the fatal flaw in Pope Francis character. It lies behind all the abuses in the Church and its feeds the deep spirit of contrariness that infects many so called "Christians" who think faith a sentiment that requires no morality. Father, you're right on target with everything you've said regarding mercy. I'm just not sure where you're finding a general consensus in truth. In this age of relativism, (your truth, my truth), genuine truth seems as much a casualty as mercy. A five minute perusal of National Catholic Reporter or USCatholic.org will confirm that. In my experience, many people simply don't want anything to do with truth at all. I happened to be re-reading Gandalf's unmasking of Grima Wormtongue the other day, and it struck me that when Grima grovels before King Theoden he pleads for "mercy," when what he actually means is that he wants to continue deceiving all those around him. Tolkien describes this character as having a "forked tongue." We have no right to take the word "mercy" at face value, if it is being used as a cloak for that which is seriously evil. guinadese, setting Truth against Mercy is precisely not what Fr. Blake has done. It is those who have the false conception of mercy, which he identifies, who have set Truth against Mercy. For instance, those who claim that people living in adulterous relationships should be permitted to receive Holy Communion have set the truth of their situation aside in order to extend (false) mercy to the adulterers. Rather than being merciful, of course, they are simply allowing the sinners to add sacrilege to their crimes and thus further increase their likelihood of reprobation. It is never merciful to aid, encourage or assist another in evil. Not telling a person the truth is the most UN-merciful you can do! Excellent. Could not ask for a clearer explanation. Refreshing. Perhaps confusion in this debate arises from not realizing the Christian definition of mercy is it is 'love that isn't deserved', this involves a negative judgement of the behaviour of the person toward whom mercy is being shown, not a kindly acqueisance in the behaviour. It implies a willingness to forgive. Thank you, Father, for your well-reasoned thoughts, always consistent with the true teaching and sentiments of Holy Mother Church. 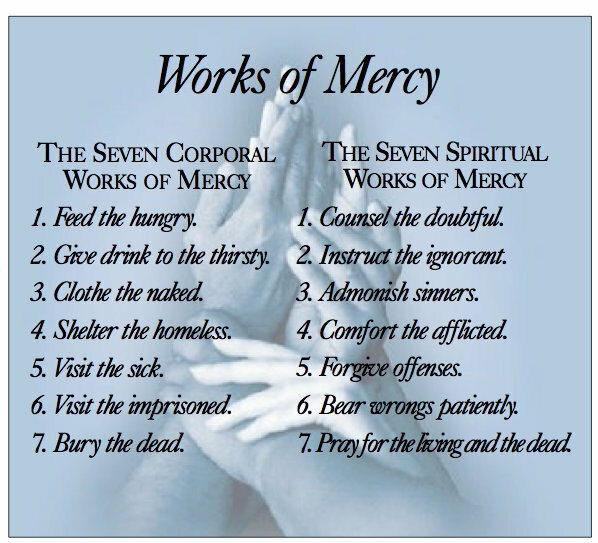 I can offer nothing better in this vein of thought on 'Mercy' than that encyclical written by Pope St. John Paul II in 1980, 'Dives in Misericordia', the link for which I include below. It is well worth the read and discerning study of it in its entirety. Victoria - Jean-Paul Sartre said that hell is other people. I expect the inhabitants of the Vatican believe that to be true. The use of the word 'mercy' is surely one of the prime examples of nominalism that Fr Serafino Lanzetta talked about. It is used without any clear idea of what it means. What a wonderful article. A must read. Father Ray I enjoy your blog thoroughly just wished I lived a little closer so I could attend your parish but, coming from Albuquerque New Mexico would make it an expensive Sunday commute. Keep writing I need the encouragement.